Sakura-Con is pleased to offer one of the largest exhibit halls in the Pacific Northwest. The Exhibitor’s Hall is located on site at the Washington State Trade and Convention Center. Our Exhibitor’s hall features a variety of vendors, including: merchants who will bring their best merchandise to you, cultural exhibitors who will teach you more about the richness of Asian culture, Industry presenting guests and the newest Anime has to offer. If you are interested in being an exhibitor please see details below. Exhibitors Hall Registration for Sakura-Con 2019 will open on June 5th, 2018. Our Exhibits Hall staff with review applications on a first come/first serve biases and all information provided will help in continuing our efforts in providing a culturally rich exhibits hall experience for all who come to enjoy the convention. For more vendor information, please review our Exhibitor’s Contract. This is for informational purposes only and you will receive the contract in full when you have been approved for a booth space. If you are an existing Exhibitor that pre-registered for Sakura-Con 2019 during the 2018 show, the booth placement process will start at 3pm PST on May 7th. An email reminder will be sent with more details. 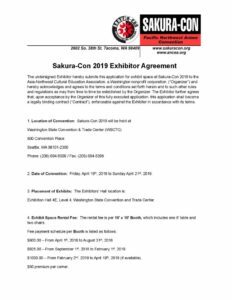 Here are the exhibitor booths for Sakura-con 2019. All are welcome to enjoy the Sakura -Con Art Show. If you are an artist and would like to participate in the Art Show, Rules and a Registration form can be found below.